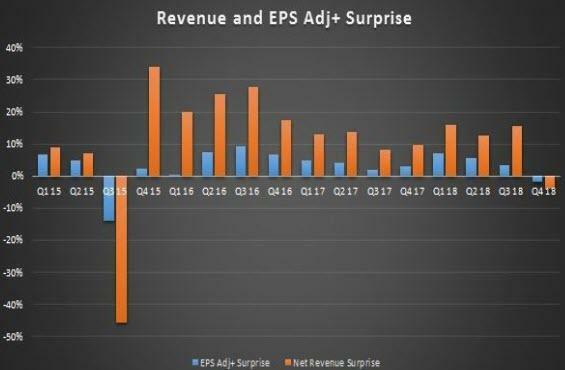 Between the disappointing revenue and EPS prints, this was the first top and bottom line miss in over three years. So alas whereas other banks could at least pretend the core business is doing well, MS had no such luxury, especially since equity sales and trading revenue of $1.93BN also missed expectations of $2.01BN; the number was "essentially unchanged from a year ago reflecting higher revenues in the financing business, partially offset by lower results in execution services." 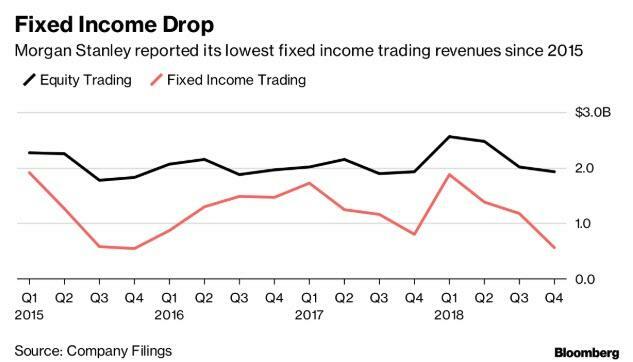 As for the FICC plunge, the bank said that this is due to "unfavorable market making conditions that resulted from significant credit spread widening and volatile rate movements." The company's key Wealth Management group also disappointed, reporting pre-tax income from continuing operations of $1.0 billion compared with $1.2 billion a year ago. Net revenues for the current quarter were $4.1 billion compared with $4.4 billion a year ago principally driven by losses related to investments associated with certain employee deferred compensation plans. Even so, total client assets were $2.3 trillion and client assets in fee-based accounts were $1.0 trillion at the end of the quarter. 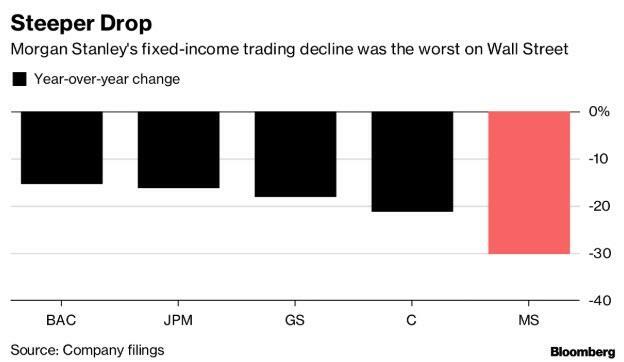 There was a silver lining in the bank's investment banking revenue of $1.49BN which while unchanged from a year ago, was better than the $1.35BN expected. Advisory revenues of $734 million increased from $522 million a year ago on higher levels of completed M&A activity across all regions. Equity underwriting revenues of $323 million decreased from $416 million a year ago reflecting lower revenues primarily on IPOs. Fixed income underwriting revenues of $360 million decreased from $499 million a year ago driven by lower bond and loan issuances. a reduction in the portion of discretionary incentive compensation subject to deferral (non-compensation expenses of $2.9 billion increased from $2.8 billion a year ago). Of course, CEO James Gorman was optimistic, saying that "In 2018 we achieved record revenues and earnings, and growth across each of our business segments – despite a challenging fourth quarter. We delivered higher annual returns, producing an ROE of 11.8% and ROTCE of 13.5%, as we continued to invest in our businesses. While the global environment remains uncertain, our franchise is strong and we are well positioned to pursue growth opportunities and serve our clients." 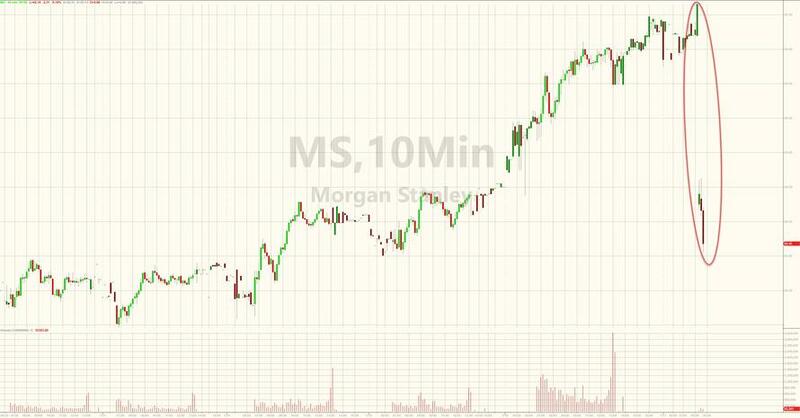 Yet after the first truly dreadful bank results of the earnings season the market disagreed, and MS stock, which is a 0.2% contributors to the S&P, tumbled 5% and sent US equity futures near session lows and in danger of breaching 2,600 - the new key support - in the S&P500. 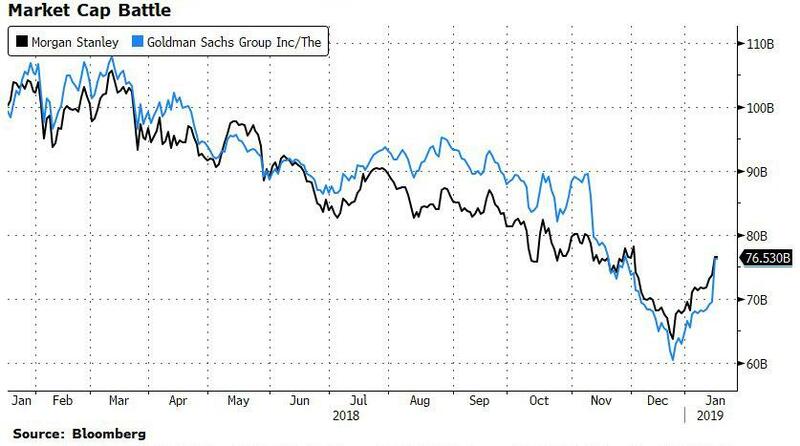 With today's drop in MS stock, it appears that Goldman is about to regain the lea in the market cap race between the two banks.